Rockford IceHogs defenseman Dennis Gilbert has adding a physical element to a team that is more focused on skating than brawling. The former Notre Damer paid a price for that style of play last weekend. The AHL suspended Gilbert for three games after taking a hard look at a hit he delivered in Sunday’s 3-2 win over San Antonio. Early in that game, Gilbert put a shoulder into the chest of Rampage forward Mackenzie MacEachern. The hit separated MacEachern from the puck as well as his senses. Before MacEachern could be helped from the ice, Klim Kostin went over and quickly dropped the gloves with Gilbert. Kostin earned an instigator penalty and a ten-minute misconduct in addition to the five-minute fighting major. At the time, all Gilbert was penalized was the five-minutes for fighting. On Tuesday, the league opted for supplemental discipline. Upon taking a long, slow look at the play, it becomes apparent that Gilbert was just a few inches high on the hit. Contact was made with MacEachern’s head, unintentional as it may have been. This isn’t the first time that a call that was deemed legal in the course of a game drew the ire of the AHL. The on-ice officials made what they felt was the right call from the perspective of a live-action hit. A few inches lower and Gilbert delivers a legal hit. Gilbert remained in the contest and assisted on Graham Knott’s game-tying goal in the third period. It was Gilbert’s first point since an assist in his season debut October 13. He’s been paired quite a bit with veteran Andrew Campbell recently. Of Rockford’s seven fighting majors this season, Gilbert has three of them. Hogs coach Derek King seemed to disagree with the ruling in his weekly media availability, though he stopped short of criticizing the suspension. King said that he had advised Gilbert to continue playing in a physical manner. In his first weeks as Rockford’s head coach, King has pushed the physical narrative decidedly harder than Jeremy Colliton. The IceHogs are far from being a punishing team in this regard, but it’s interesting to see how this plays out as the season progresses. Gilbert’s absence prompted the Hogs to recall D Josh McArdle from the Indy Fuel Tuesday. The Rockton, Illinois native was in the lineup at the BMO November 7 against Iowa, thought that was Rockford’s morning school-day game. He should get a big reception from the home fans if he gets into a game this weekend. The next day, goalie Kevin Lankinen was assigned to the Fuel, signaling that Collin Delia was ready to return to action after missing the last three games. 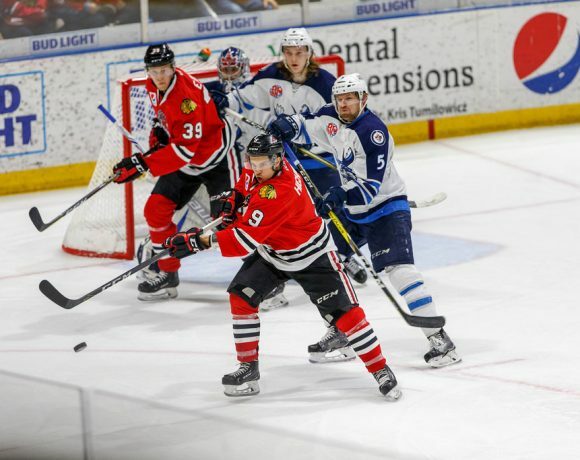 Lankinen played well in this most recent stint with Rockford, picking up his first win of the season Sunday afternoon. Rockford is attempting to win consecutive games for the first time since November 9 and 10. To do so, they will have to shut down a streaking opponent. 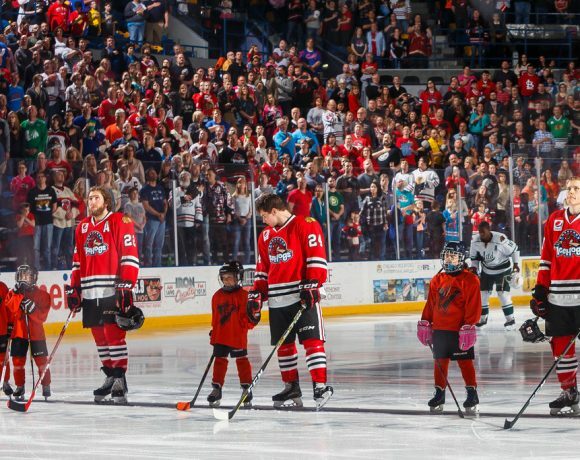 Grand Rapids, the hottest team in the Western Conference, comes to Rockford Friday night. The Griffins have won seven of their last eight, with the lone loss coming in a shootout against Milwaukee back on November 23. Veteran Chris Terry leads the Grand Rapids offense with 15 goals and nine helpers in 23 games. Matt Puempel has chipped in with ten goals. Veteran centers Turner Elson (8 G, 13 A) and Carter Camper (5 G, 15 A) have also been steady contributors. Rockford will probably be looking at Patrik Rybar (6-2-2, 2.27, .910) in net for the Griffins. Rybar held the Hogs to a single goal November 14 in Grand Rapids, stopping 29 shots on the way to a 3-1 victory. 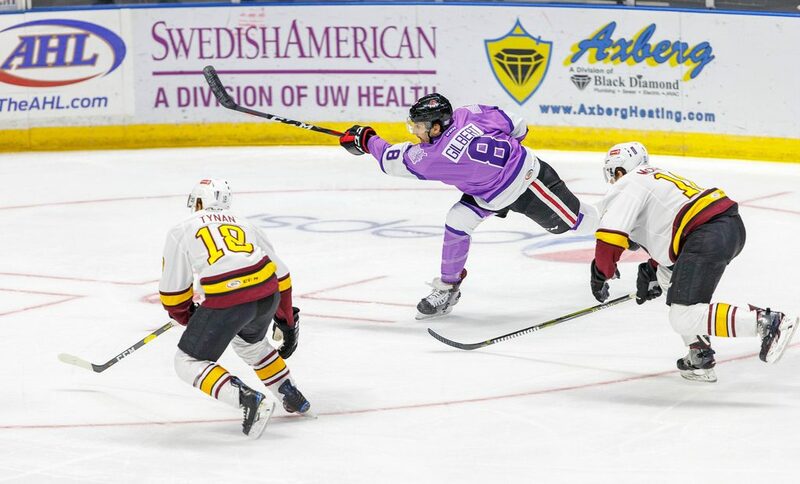 Saturday night is another Illinois Lottery Cup tilt with the Chicago Wolves. 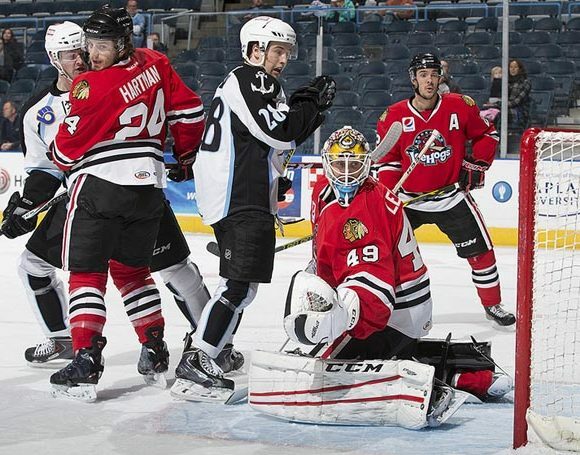 Chicago has struggled of late, but rallied from a three-goal deficit to beat Iowa in overtime on Wednesday night. Former IceHogs forward Brandon Pirri has picked up his scoring pace, with six goals and eight assists in his last ten games. He currently leads the AHL in scoring with 30 points (10 G, 20 A). Follow me @JonFromi on twitter for thoughts on Rockford happenings throughout the season.